JPY is here – Payoneer customers can now receive payments from Japanese companies! Images from Digital River. Check out their amazing infographic HERE. Asia-Pacific is now the largest regional marketplace for eCommerce. 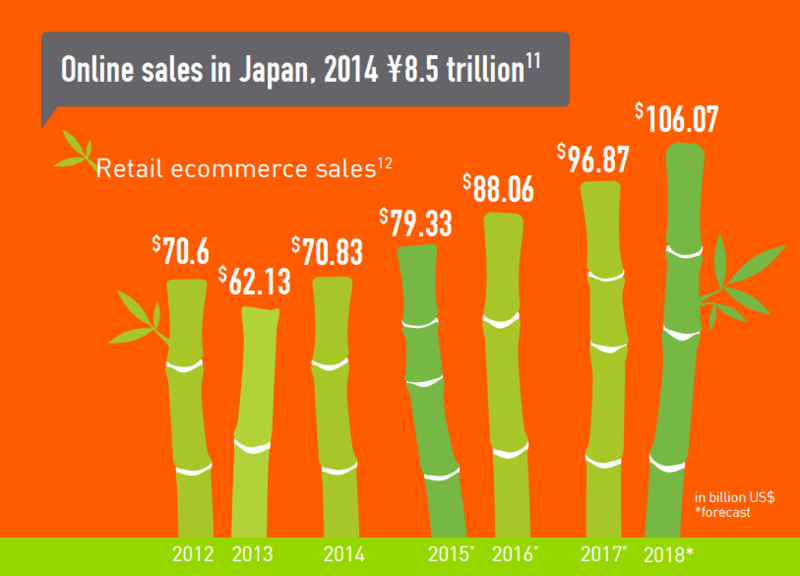 Though small (about the size of California), Japan is an eCommerce powerhouse. It ranks fourth overall in eCommerce sales, behind China, the US, and the UK, with estimated sales of $80 billion. But looking to the near future, we see even more opportunity as Japan’s online sales are expected to grow to over $106 billion by 2018. How do I capitalize on the Japanese eCommerce market? 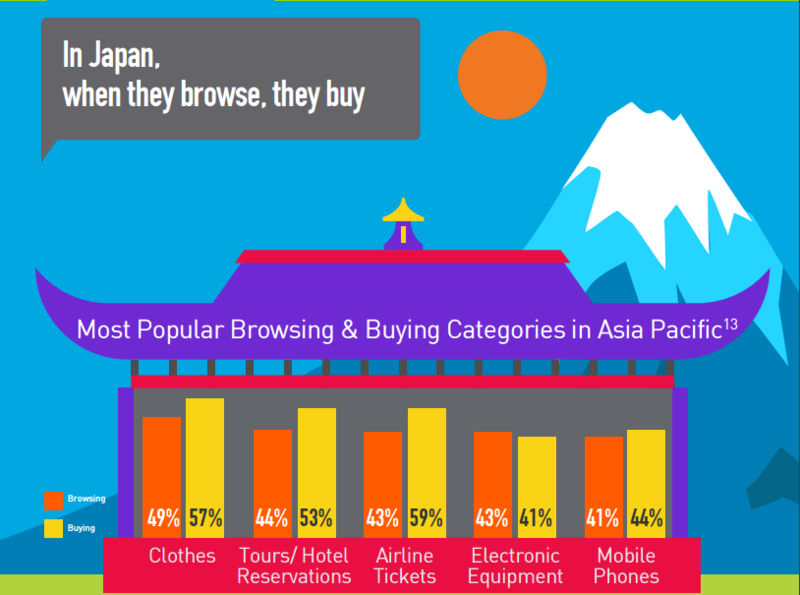 Most online shopping in Japan is conducted on marketplaces. Ever heard of Amazon? Yea, we thought so. Well, if you are already selling on Amazon.com or any of the Amazon Europe sites it’s time to add Amazon.co.jp to your repertoire and officially break into the Japanese market. If you are a Payoneer user already selling in Japan, click here to enter your email address and we’ll set up your JPY receiving account. View the full infographic by Digital River, HERE. But Amazon isn’t the only option for eager sellers looking to capitalize on the Japanese eCommerce market. Rakuten is extremely popular, with 28.8% of the total eCommerce market share. And, rounding out the top three Japanese online merchants is Yahoo! Japan Shopping. Together, these three platforms account for almost 50% of total eCommerce sales in the country. How do I receive Japanese Yen via Payoneer? Payoneer’s Global Payment Service provides you with access to international receiving accounts, which essentially act like a local bank account and allow international companies to easily send you a local bank transfer – as if you had a local bank account! You can easily receive payments in JPY, and the best part is…ZERO currency conversion fees when receiving payments and ZERO loading fees! Are you a Payoneer user currently selling on Amazon Japan? You are likely using Payoneer’s USD receiving account and then converting funds to your local currency and then withdrawing to your local bank account. With Payoneer’s addition of JPY, you can easily add your new JPY receiving account and get rid of that pesky 3% currency conversion charge. Once you receive payment, you can withdraw the funds at any time to your personal bank account, in your local currency. What goods should I be selling in Japan? In 2014, the online retail fashion market in Japan was estimated to be worth more than $100 billion. Let’s just say that again. One. Hundred. Billion. Dollars. According to a survey by Digital River, the most popular items are clothing, travel related items and electronics. And lucky for online sellers, Japanese consumers make a conscious choice to try products in store and then purchase them on shopping platforms….how convenient! Brand: Japanese purchasing decisions tend to be heavily influenced by the media, as a result, popular and visible brands tend to sell better. Sellers should stock up on quality brands that are very trendy in order to be successful in Japan. Reputation: In Japan, business is often done after a good relationship based on trust is built. When it comes to eCommerce, consumers also base their purchasing decisions on trust by buying from retailers with good reputations that are known for producing reliable products. If you want to be successful in Japan, make sure you have lots of strong feedback from happy customers. Site design: If you are looking to expand your eCommerce site to Japan, you’ll want to localize the content and design. Busy and colorful is the norm in Japan as is tons of information. In regards to site info, our Japanese team tells us, “More is better. Way more is best”. Additionally, 99% of the 125M people in Japan speak Japanese…exclusively. If you don’t plan on translating AND more importantly, localizing your site, you’ll have a hard time creating success. Shipping: Merchants should be aware that Japanese customers are used to exceptionally fast delivery speed in Japan. The most popular shipping companies, Sagawa and Kuroneko Yamato, are able to deliver the same day and most Japanese customers expect this level of service. How to Receive Funds from Amazon and other marketplaces, today! 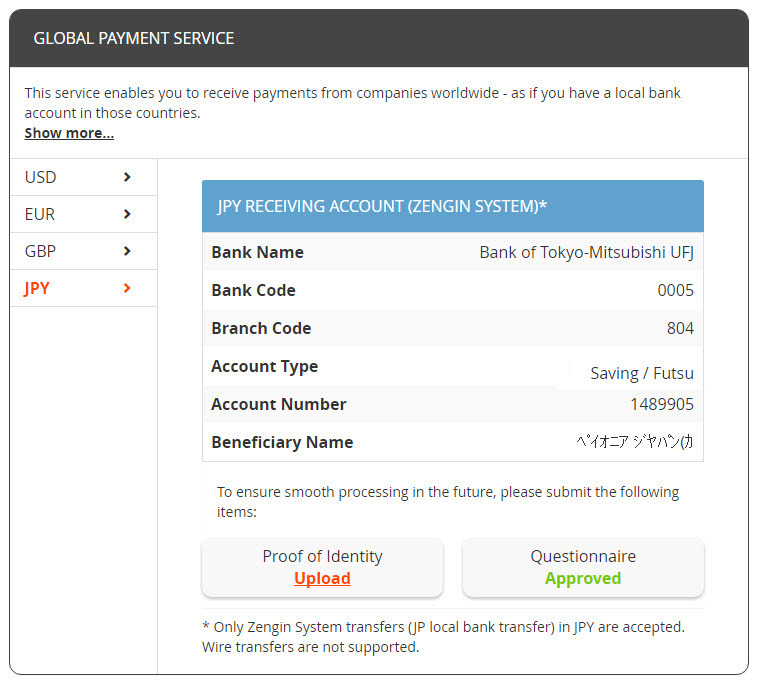 Click JPY to display your JPY receiving account details. Add your JPY receiving account details (see example below) to Amazon Seller Central Japan. Please Note: When adding your account details to Amazon Japan, the Beneficiary Name (Account Holder Name in Amazon Seller Central) will not be your personal name. Due to Japanese bank regulations, there is one Beneficiary Name for all Payoneer users. Please copy and paste the name as it is displayed in Japanese. If you are ready to start selling on Japanese marketplaces (other than Amazon) check out this blog to see how to connect Payoneer with your favorite marketplace. We are rolling out JPY to more and more customers every day. If for any reason you don’t see your Japanese receiving account details when logging in to Payoneer, click here to enter your email address and we’ll send you an email shortly with the info. And, if you’re not yet a Payoneer user, you can use this same link to sign up now!